Even though it’s a very well-known drink in South-America, we had never heard of it until our friend, Jen mentioned it to us. We got curious and rounded up our favourite intercambio friend, Gastón (who is incidentally from Argentina) to give us a crash course about this drink. 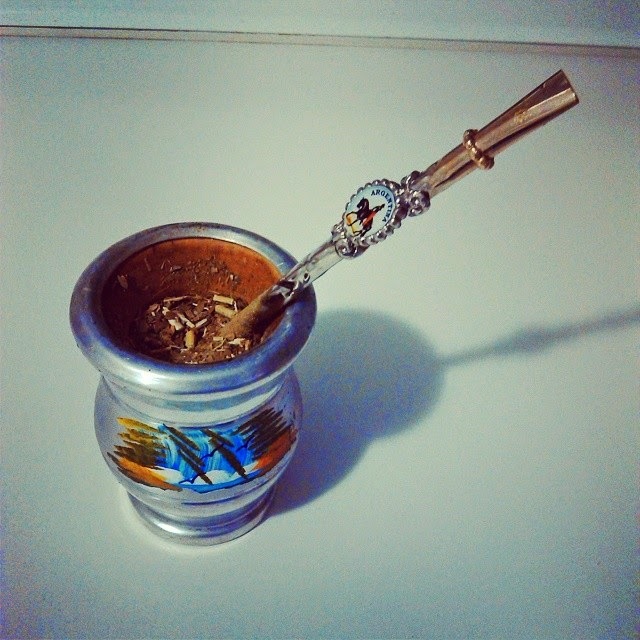 ‘Mate’ is a traditional drink of caffeine-containing Yerba leaves, similarly to tea. It has its own small gourd/pot which you should never wash, and the more you use it the nicer the tea gets. Apparently in Argentina it’s the ‘national infusion’ and everybody walks around with the little gourd and a thermos of hot water. You crack your little mate pot out, stuff it with leaves, put some sugar on top (optional) and pour hot (but not boiling) water on it. Then use the metal straw (traditionally made of silver) to drink up all the liquid until you hear the slurping sound. It’s a signal that it’s time to give over the pot to your friend. Gaston said that usually one person serves all the others in the circle. Yerba is sold in these convenient pots where you keep the sugar in the smaller compartment and the leaves in the bigger one. As you can see, mate drinking has a strong cultural aspect to it therefore it is often consumed when friends and family get together. They sit in a circle and start drinking mate. Because of this if you ever see a group of people on the street drinking tea together, they will be most likely from Argentina.